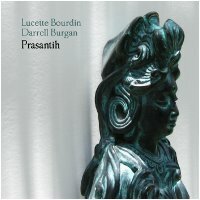 Lucette Bourdin and Darrell Burgan return to Earth Mantra with their second collaborative release, an album of soothing ambient electronica entitled Prasantih. Sometime in winter 2009-2010, Lucette and Darrell began working together on some cross-composed music, to see what sort of results might emerge from such a collaboration. Living thousands of miles apart, face to face recording was impossible. So instead they embarked upon a free-form style of composition, where each artist recorded bits of solo material called doodles, which were then shared mutually and remixed and reworked into whole new pieces. The result was a set of lovely ambient tracks that often bear little resemblance to the individual doodles that went into them. The music they created is an interesting blend of their unique styles, a collection of light ambient compositions that the artists thought turned out nicely. During these sessions, Darrell and Lucette recorded so much material that multiple albums worth of music was the result. Their previous release from this collaboration, called Samhata, is also available here on Earth Mantra. Like Samhata, Prasantih came from the same set of sessions, but contains unique unrelated pieces with a slightly different feel and aesthetic point of view. Lucette and Darrell sincerely hope that everyone enjoys listening to this release as much as they enjoyed making it. And Earth Mantra is very happy to be releasing the second set of music by these two artists. Highly recommended. Read a nice review here. A superb album of smooth melodic ambient, going deeper and more melancolic in the 4 last tracks. Its nostalgic vibe makes it a perfect listening for moody autumn evenings. Great Stuff, Amazing. Really cool ambient pieces, with a nice blend of light and dark and some world influence put in for good measure. Check it out!